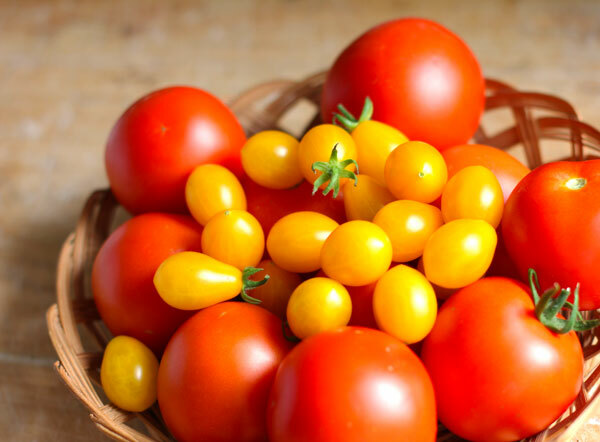 I have been at my Grandma’s for a couple of days and I got way too many tomatoes from her garden, the pretty red and yellow tomatoes that you just want eat right there in the greenhouse. I love tomatoes, they are my favourite vegetable (or technically fruit). 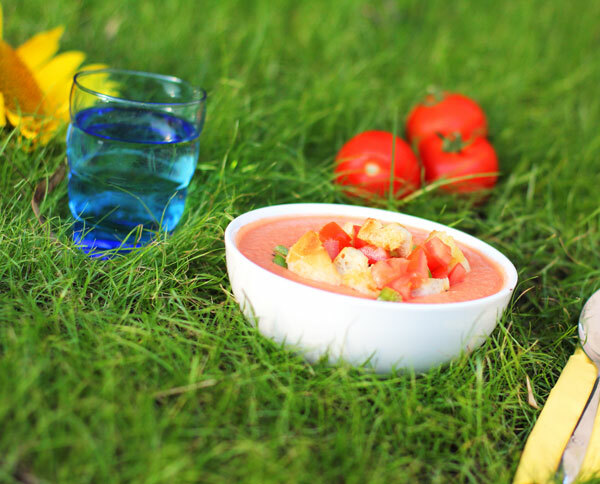 Tomatoes + Hot weather = Gazpacho . I have been eating almost every day for the past week. Making new batches every two days. It is just too good to pass. The ecipe can be varied almost infinitely, just whizz everything in a food processor or with an immersion blender and chill for a couple of hours. I made loads of small batches with different combinations and ratios of the veg. The recipe below is one of the best batches but I have failed to make a batch that was less than great, so you can go wild with this one. 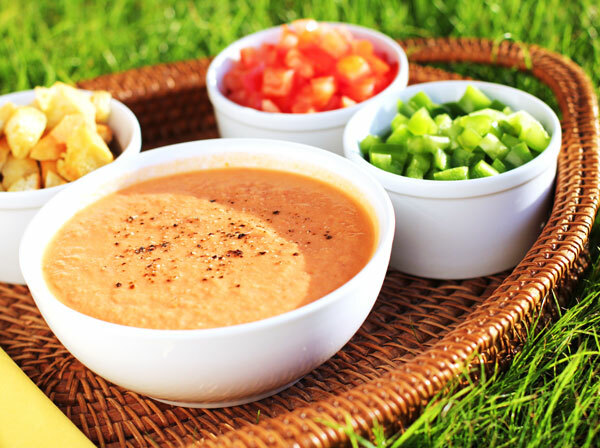 I have added a slice of bread soaked in the tomato juices for a thicker soup but it really is just as good without it. I prefered the thicker, eat-it-with-a-spoon consistency but you can also create a thinner, lighter and almost drinkable version. And for the toppings, anything is allowed. I have made some croutons and chopped some tomatoes and green peppers. 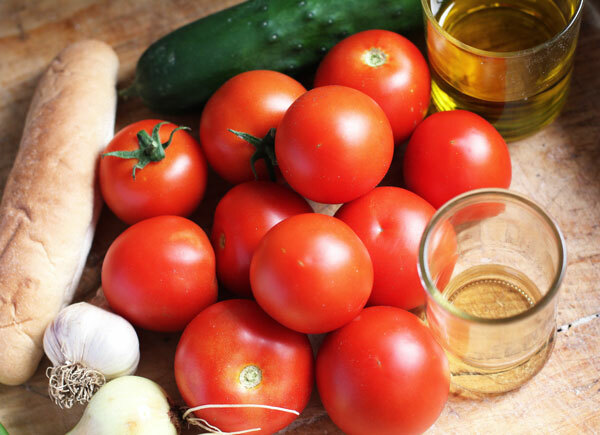 But you can add boiled egg, spring onions, olives, ham or anything else that you fancy. 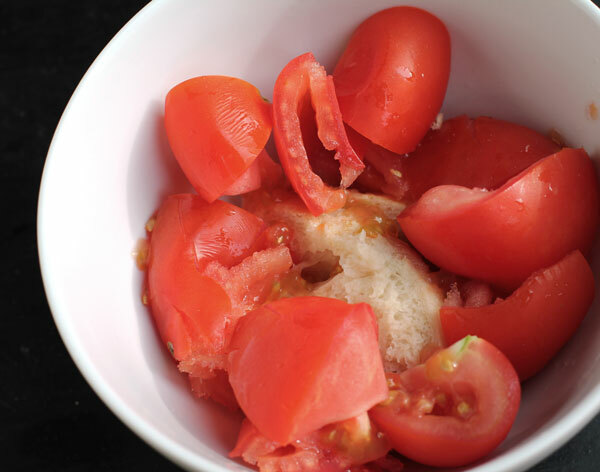 Quarter the tomatoes and squeeze into a bowl with the bread, leave for 20 minutes. Peel and roughly chop the cucumber, shallots and garlic. 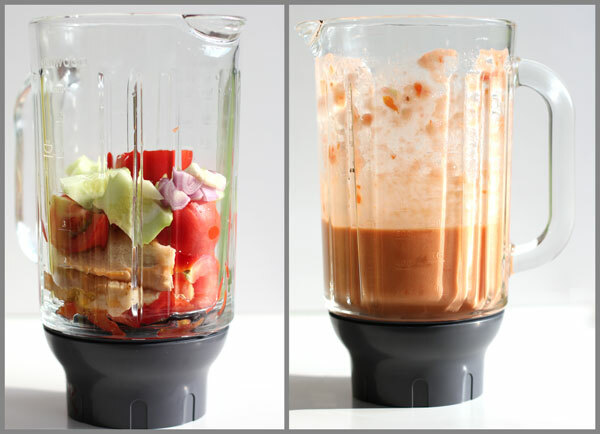 Whizz everything in a blender while slowly adding the olive oil. Add the salt and vinegar and taste and adjust seasoning. Serve with any of the garnishes above. vzpominame na tebe a tve gazpacho, jdeme se Zuzankou na to. Posleme ti fotku, jak se nam to povedlo. Moc nam tvuj food blog chybi!